A medieval city destined for greatness, immense power and importance beckons you. Citadels is enjoyable card gaming at its best, a fantastic little game that deserves a place on every gamer’s shelf (along with its expansion, The Dark City, which now comes included with the base game). It’s also, I believe, the first game I designed a reference sheet for. 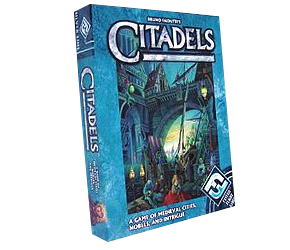 In Citadels the object is to build a medieval city of eight districts before the other players. The twist is, each round players secretly choose from a deck of eight characters (Assassin, Thief, Merchant, King, Architect, Warlord, Bishop, or Magician), each with special abilities. The deck is passed around and roles chosen, and they’re revealed in a set order, so part of the game is guessing what your opponents have chosen and bluffing about which role you chose. Once you’ve taken your action—anything from ‘assassinating’ another player (they miss their turn) to destroying one of their districts—you can take gold or build a city district. The first player to build eight districts ends the game and points are totalled. The card artwork is beautifully done and has a lot of personality, and the little solid plastic gold pieces are a great touch. Citadels is a lot of game value in a little box, surprisingly strategic, and always a huge amount of fun for newbies and experienced gamers alike. It can also be played with up to eight people, and with as few as two (though it’s probably best with five or six). In addition to a rules summary (including expansion setup rules), this file includes a turn sequence and character description reference for all 18 characters. Great work as always – though I notice the summary doesn’t include setup rules for 8 players, which are now supported out of the box (in the current edition which includes the expansion)? I’m afraid my copy is quite old and doesn’t have those rules.